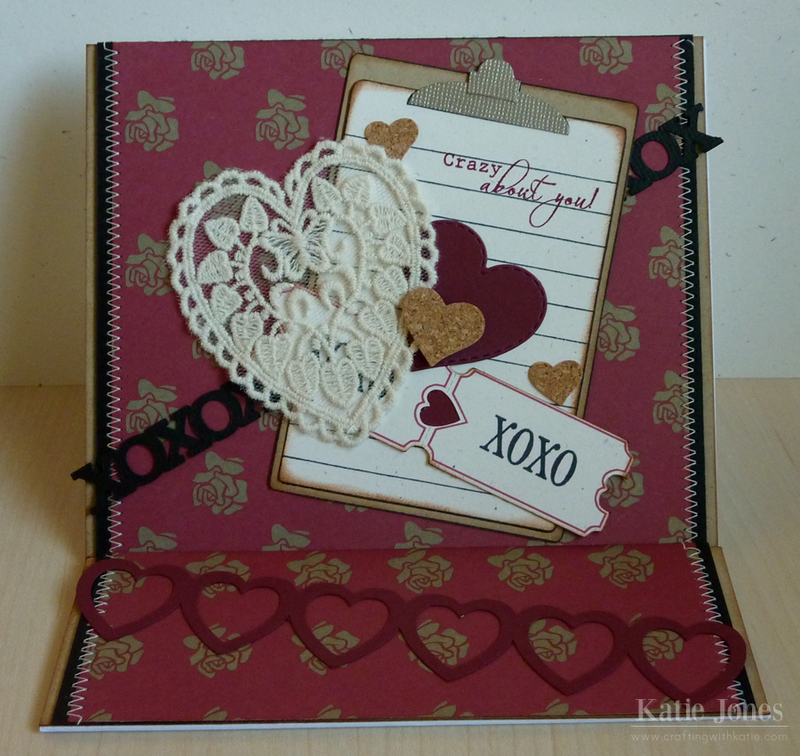 crafting with katie: Crazy About You! It's my day to post on the Jinger Adams blog, and I have a pretty Valentine to share with you! I used one of Jinger's Pop-Out Easel Cards, which are so easy to use, since they are all put together! You just need to layer on some pretty papers! I started by adhering a 5" x 6" piece of kraft cardstock to the card. I then took a pretty 5 1/2" x 5" piece of patterned paper from Jinger's Gypsy Queen collection, and stitched it to a 5 3/4" x 5" piece of black cardstock before adhering it to my base. Now for the fun embellishments! The XOXO strip was cut with my Cameo at 0.5". I then made a clipboard using My Creative Time's Honey Do List and stamped it with a sentiment from MCT's Lots of Love. The heart tickets are another Silhouette cut, and I cut them at 1" before stamping them with a sentiment from MCT's 100% Sweetness. 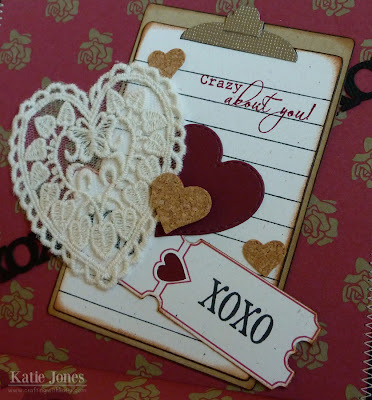 I added various cork and cardstock hearts cut with MCT's Stitched Heart Layering Dies and the Stitched Scallop Heart Die Set before adhering a gorgeous lace heart doily from Jinger Adams. The bottom of the easel card is 2" x 6". I just adhered the same types of layers as the top, and then added another border strip cut with the Silhouette. Very pretty card. I really like the embellishments you chose. Beautiful card! I love the lace heart...the whole card is so beautiful! Great job choosing items to go on it and the arrangement is perfect. Love it! Katie, JUST LOVE this card you created ....awesome! I have so much invested in Cricut, but seriously thinking of getting a Cameo sometime this year. Katie ~ This card is just BEAUTIFUL!! From the sewing, to the "XOXO" & the heart strip, the cork and oh my that clipboard!! Just LOVE allthe elements ~ but that heart doiley ~ I LOVE the cork hears too! AMAZING as always!! Have a wonderful weekend ~ 3 days!! YEAH!! Lovely card!! I really like the zig-zag stitching and your use of the clipboard on this card. Fab job!! lovely card, love the laced heart! !